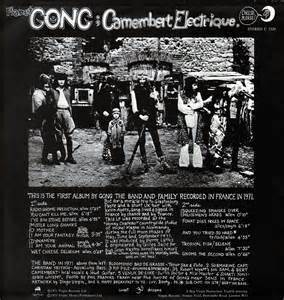 Camembert Electrique the third, but first real, album by Gong was released in 1971 when, to be honest I wasn’t really ready so I missed out on the offer of a whole album for 59 pence. However a few years later I came across the record in a junk shop for, wait for it 59 pence.I was probably provoked into a panic by the fact that the record hadn’t lost value and so I bought it. It wasn’t an easy decision after all it still represented two hours of sweated labour but in the end it represented money well spent. But music aside (and like the Grateful Dead Gong were always about so much more) what really impressed me was the record sleeve. On the front was a proper drawing made with real pen on real paper but it was a simple black and white photo on the back that used you grab my attention while listening to ‘Fohat Digs Holes in Space’. On the far left is Didier Malherbe (Bloomdido Bad De Grass) saxophone and flute player. He’s almost out of the picture but at this point he’s a major force in making Gong Gongier not yet 30 he looks a lot older but being French that’s of little consequence. Next in line is Christian Tritsch (Submarine Captain) who plays Bass but really wants to be a lead guitarist which means he will soon be a footnote on the Gong story. I always liked the Submarine Captain largely because in this picture he’s got a cool hat and seems to be wearing jodhpurs..crazy guy. The next band member is really just passing though which means he never gets a a nickname. Its Pip Pyle, a great drummer and part of the Canterbury scene. Allen never really understood drummers and over the next few months they come and go (Pyle actually returns later). Pyle looks like he’s tripping over Sam Wyatt, son of Robert who, strangely enough, is the only one actually looking at the camera.. Luckily Sam’s positioning hides the fact that Pyle is actually wearing stockings which is horribly apparent in the colour out takes of the session. 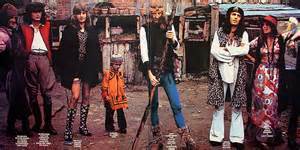 Daevid Allen (Bert Camembert) is kind of centre stage casually dressed in tights, boots, headband and carrying a big stick, strangely he doesn’t look posed or ridiculous its just Daevid . Eddy Luisse is the mystery keyboard player who again wont stay and wont have a nickname.He is the only one who looks a little uncomfortable despite being the most sensibly dressed. Last, but not least is Gill Smyth (Shakti Yoni) who will always be on hand if you need a space whisper, Gong seemed to need quite a lot of it. Gong went onto greater things for a while, due in no small part by the additions of Steve Hillage on guitar (who of course played with Alex Harvey at Glastonbury) and Tim Blake on synthesiser who both made the band distinctive and musical. This entry was posted in memories of 70s, rock music and tagged 1970's, 70's music, Britain, Camenbert Electrique, French Rock, Gong, Hippies, prog rock, rock music, space rock, vinyl. Bookmark the permalink.